"A moment comes, which comes but rarely in history, when we step out from the old to the new… India discovers herself again." Independence Day is considered as a national holiday in India which is celebrated with utmost joy and happiness all around in India on which the roads are embellished with ribbons and Indian flags. It is a day to pay a mark of respect to our freedom fighters because of whom we are breathing an air of freedom. Everywhere we see a flag hoisting ceremony across India on the day of Independence. We can see in every house, clubs, private and government organizations in cities and Villages that people hoist the flag representing the citizen of free India with more enthusiasm and joy. Schools and Colleges also celebrate the independence day by first hoisting the flag within their premises. Indians whether residing in India or abroad celebrate the day in the same way being proud to be an Indian by hoisting the Indian flag with utmost happiness. On the eve of the Independence Day, the President of India delivers the "Address to the Nation", this is televised nationally. 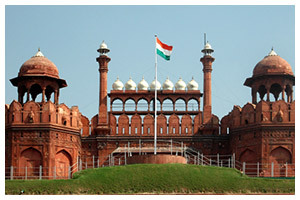 On 15 August, the Prime Minister of India hoists the Indian flag on the ramparts of the historical site Red Fort in Delhi. Twenty-one gun shots are fired in honor of the solemn occasion. During the speech, the prime minister highlights the achievements of his government during the past year, raises important issues and gives a call for further development. He pays tribute to the leaders of the freedom struggle. At last, The Indian national anthem, 'Jana Gana Mana' is sung. 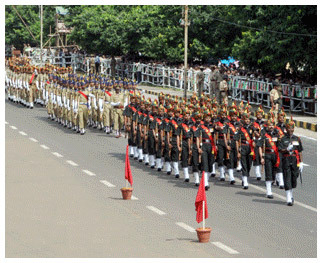 Similar events take place in state capitals where the Chief Ministers of individual states unfurl the national flag followed by parades and pageants follow. Cultural programs take place in government and non-government institutions in the country. 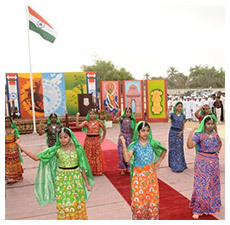 Schools and colleges conduct flag hoisting ceremonies and various cultural events within their premises. In School and Colleges, we often used to see that independence day is celebrated in a mood of abandon and joy. They mark the day with cultural programs , flag hoisting and distribution of sweets. Students take part in Parade carrying the national flag in their hand enchanting ‘Vande Mataram' .The celebration is done in the same way in Government and Private organization. Television channels show patriotic movies and Continuosly plays patriotic songs from old and new Hindi movies. The media people go to town and nearby schools and colleges with a variety of contests, programs and activities related to Independence day. The Prime Minister's address to the nation and the march-past are relayed live on national television. In some cities, such as Delhi, kite flying is a celebratory event associated with the Independence Day. Citizens adorn their cloths, wristbands, cars, household accessories with replicas of the tri-color. Major government buildings are often adorned with strings of light. The speech given by the Prime Minister is followed by March past by divisions of the Indian Army and paramilitary forces. Special parades and pageants showcasing events from the struggle for independence as well as cultural traditions of the country. A collaborative Parade of India's armed competencies by the three forces and patriotic skits and also dramas by school children are an integral part of the Independence Day Celebration. On this Day, People indulge in kite flying competitions and children cheer aloud elevating the spirit of the day. The aim of Independence Day should not only be to celebrate the day as a holiday. There should be serious efforts in educating the present and future generations about the freedom struggles which the Saviors underwent to give us the freedom that we enjoy today. We should always remember that the freedom we earned was not easy and was through a lot of sacrifices and bloodbath, and that we should always respect our freedom, instead of taking it for granted.